I recently bought this original 8.5x11 from artist Paul Smith. Who else has bought original pieces? Does reproductions of original art acceptable? ... I have a couple of them that I like to share. Perhaps there's another thread for prints; I have those as well. There's a sense in which every comic book is a reproduction of original art anyway, but let's keep this discussion for unique pieces, including convention sketches. I've got some including Batman by Jerry Robinson, Baron Karza by Michael Golden, the Flash by Carmine Infantino; I just have to dig them out. When I do I'll share them. BTW, I LOVE that Paul Smith Saturn Girl. Love the Legion and I've loved Paul Smith's work since I first saw it in Marvel Fanfare. Wish he'd do more comic work. I got a Hopey Glass original by Jaime Hernandez back in '83 when I wrote him an embarrassingly gushing fan letter and sketch request (he generously sent me an inked piece). And two years ago for my fiftieth birthday my brother and a pal surprised me with a gorgeous Captain Marvel Jr. piece by Ramona Fradon. I'll share when I have a minute. and a page of original art from Elementals by Willingham. TONS by artists from the late 80's-current, including Terry Moore, Cully Hamner, Brian Stelfreeze, Adam Hughes. . etc. I have a page of Gene Colan art, a gift years ago from former CBR Classics Board moderator Scott "Lone Ranger" Mahaffey. I'd have to dig it out to remember what series it's from. "J'emm, Son of Saturn," I think, or possbily "Silverblade." At any rate, I'm thrilled to own a piece of my all-time favorite funnybook artist's ouevre. I summon the good stuff! That's awesome, and an awesome gift to give too. I wish Scott had moved over here with us all. For me, he's the one big presence from the old CBR Classics board that is sadly lacking from the CCF and is greatly missed. I picked up a fun little piece today at a comic show, but I won't be able to post pics until tomorrow night or Tuesday sometime. 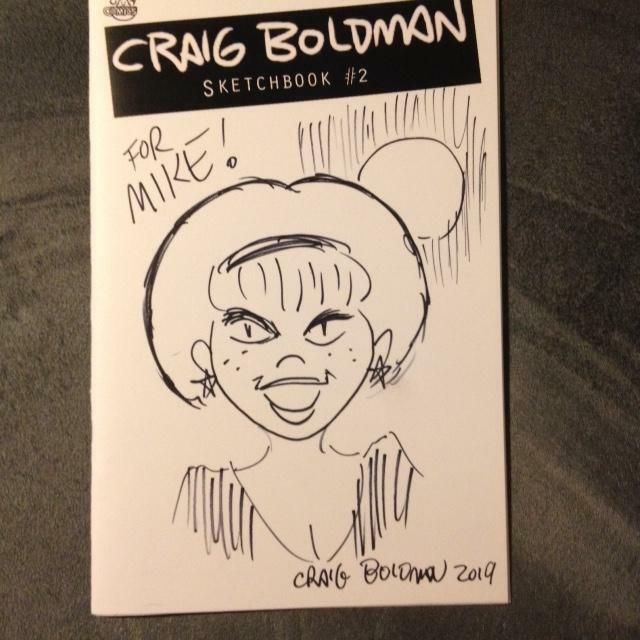 Craig Boldman, Archie artist extraordinaire had a unique sketchbook for sale at his table-due to a recent flood at his house, he had to go through boxes of old stuff to try to salvage what he could. In an old strongbox he found a series of pages he drew as a kid that were his first attempt to draw a comic book. As many artists are, he was slightly embarrassed by his early efforts in this case he was still in grade school), but he decided he wanted to redraw those pages now in his current style as an homage to the passion he had as a kid but with all the skill he has accumulated over his career. So he put together the sketchbook featuring the all new pages, plus reproductions of the original pages in a smaller size, and packaged it with a blank cover upon which he does a quick sketch of any Archie character you choose for you when you buy the sketch book. I had him do Sabrina for the sketch. As a big fan of the creative process of making comics, I loved seeing the then and now pages, and the original sketch was just the icing on the cake. Oh yeah, and he only charges $5 for the book, sketch and all. It was also fascinating to watch him do the sketch and see the image built line by line, all done in Sharpie with confidence and skill. I also have a framed head shot of Jonny Quest that creator Doug Wildey drew for me at the 1984 San Diego Con, and a couple of jam pages with quick sketches by the likes of George Perez, Sergio Aragones, Mike Zeck, Jim Valentino, Archie Goodwin, Bruce Patterson, Jerry Bingham, Chris Claremont, and a few others I'm forgetting, souvenirs of the same convention. I summon the ;80s time capsules!